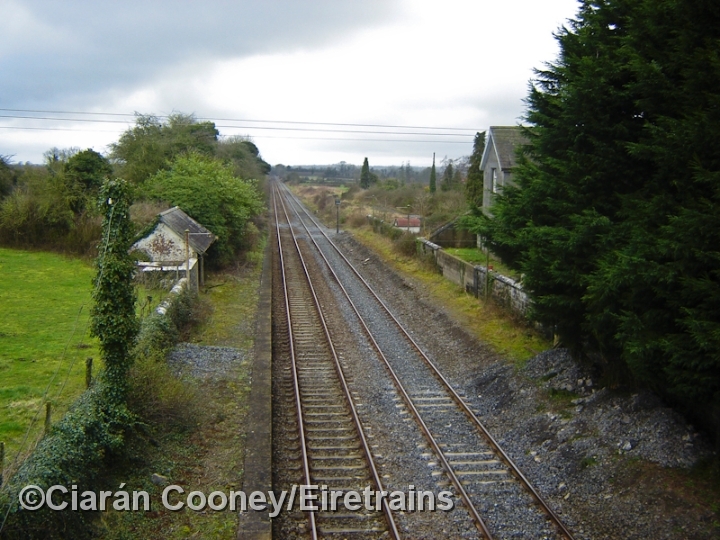 Goold's Cross, north Co.Tipperary, is located on the Great Southern & Western Railway's main Dublin to Cork line between Limerick Jct and Thurles. 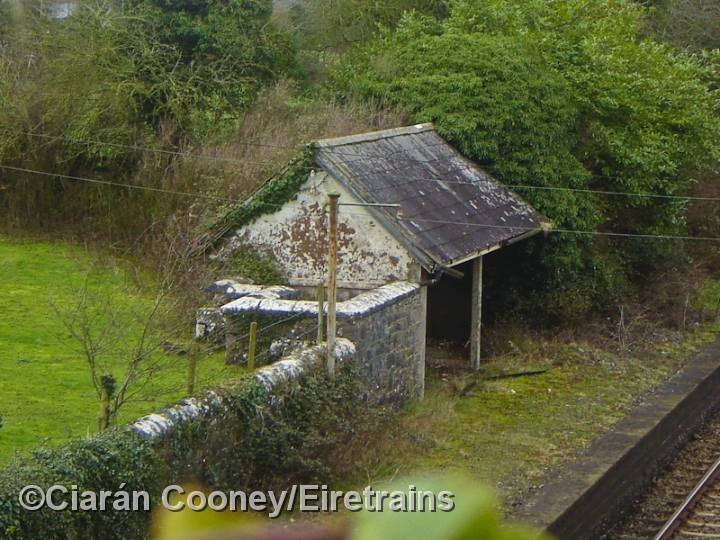 Goold's Cross was once the junction for the short branch line to the well known town of Cashel, which diverged just south of the station. 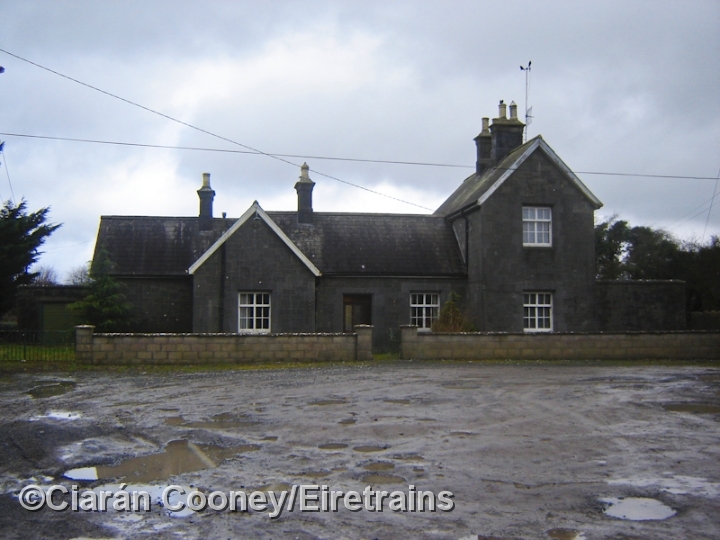 The branch to Cashel was opened in 1901, but lost its goods & passenger services in 1947, but remained open for a monthly cattle train until September 1953. Up to 1986, Goold's Cross station remained much intact, but with the closure of the signal cabin in that year and the rationalisation of the mechanical signalling, the down platform along with associated crossovers and sidings were all removed. Today, the station building dating from October 1849, and the up platform remain complete with waiting shelter remains. The dismantled GSWR footbridge is dumped in the former goods yard. 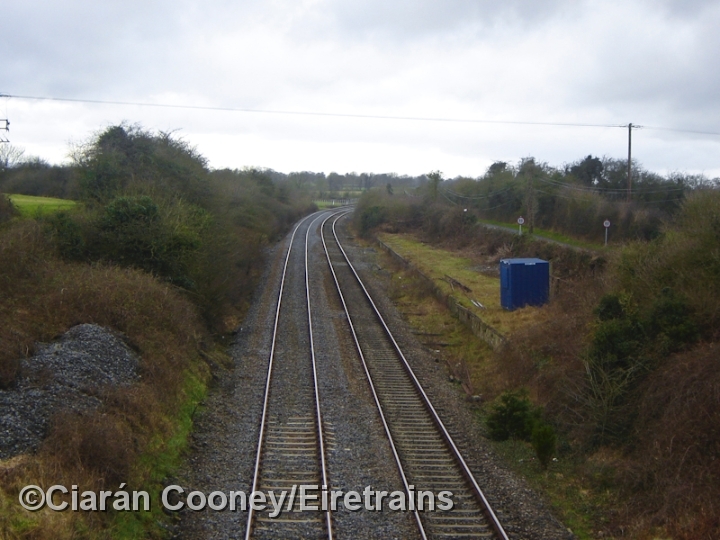 1 The former station at Goold's Cross, looking north towards Dublin from the road overbridge. On the left is the disused up platform complete with shelter, while on the down side is the main station building. 2 The stone built station at Goold's Cross, dating from 1849. The Great Southern & Western Railway chose a simplistic design for the building, unlike others with architectural merit. 3 This is the former waiting shelter on the disused up platform. Beisde it can be seen the toilet block, and a redundant platform lamp post. 4 The GSWR ornate footbridge remains dismantled in the former goods yard at Goold's Cross Station. Although the station closed in 1976, the footbridge remained in situ until the late 1980s. 5 A view looking south towards Cork from the road overbridge at Goold's Cross. 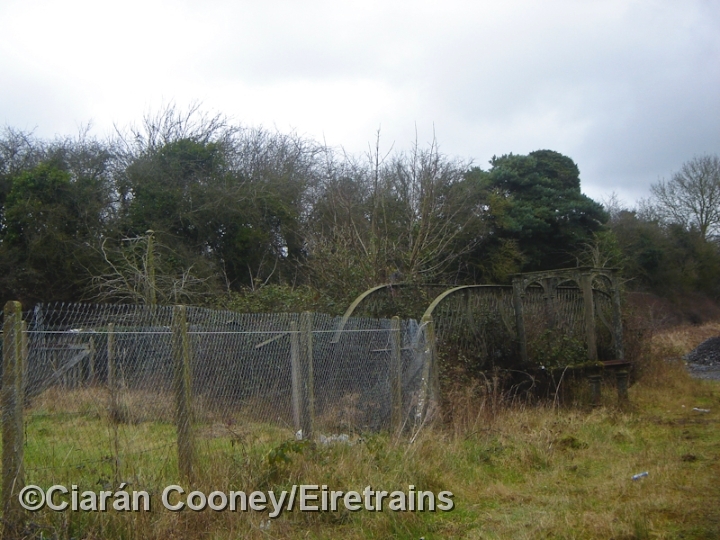 The signal cabin was once sited on the right beside the former cattle bank, while the former branch line to Cashel diverged towards the left. 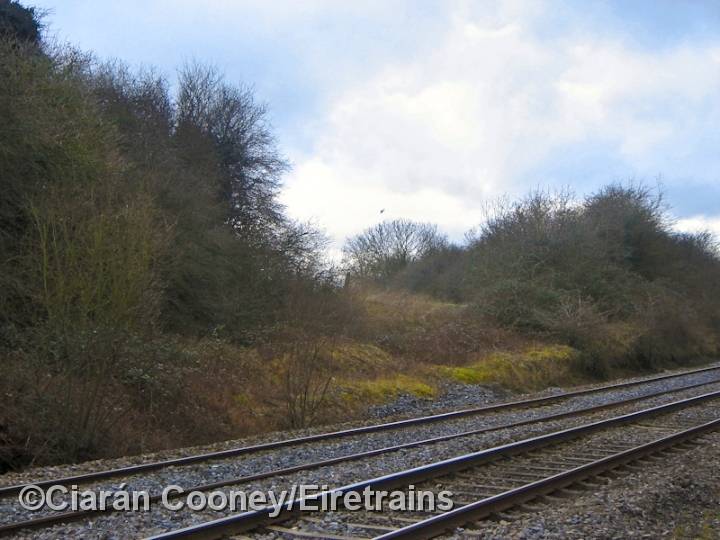 6 The site of the junction with the Cashel branch at Goold's Cross can still be seen, with the partially filled in trackbed diverging to the south east visible in this view. The branch line closed completely in August 1954 and was lifted shortly after. 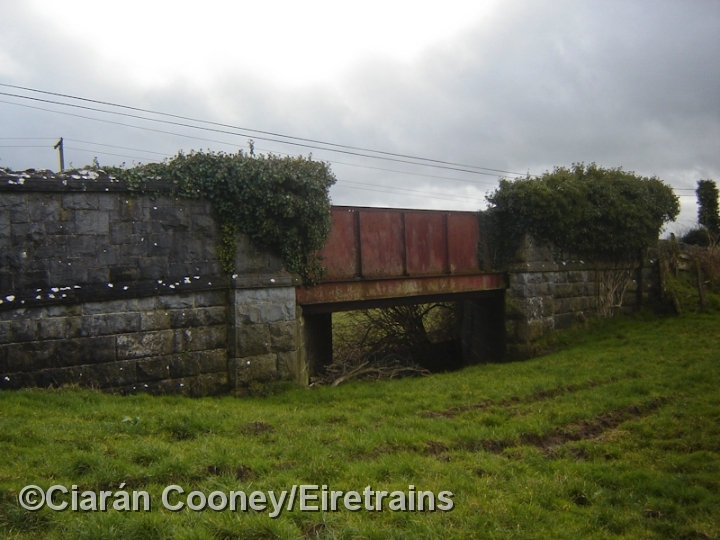 7 This is the first road overbridge south of Goold's Cross on the former Cashel branch. Part of the trackbed here has been filled in here but the stone abutments and the metal plate bridge remains in situ.